Demanding restoration of the old pension scheme, over 20 lakh Uttar Pradesh government employees went on a strike on Wednesday. Despite the imposition of the Essential Services Maintenance Act (ESMA), 1968, on all government employees on Monday, February 4 by the Yogi Adityanath-led BJP government in the state, the employees decided to launch a strike. 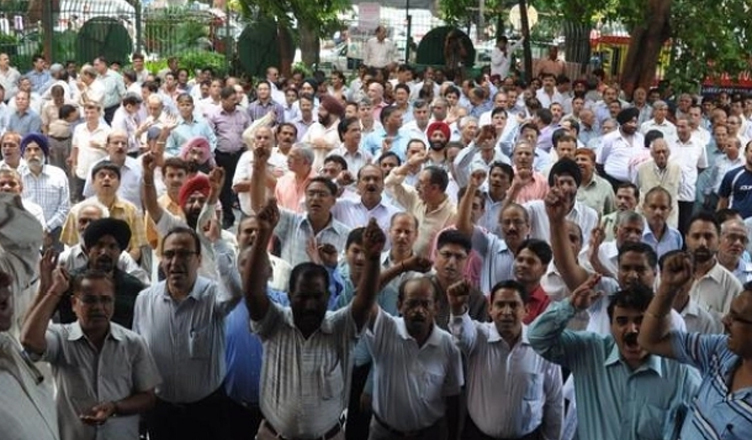 Fearing that the employees might go on a strike opposing the same, Chief Secretary Anoop Chandra Pandey had directed all district magistrates to impose the ESMA Act on the striking employees on Tuesday. However, that could not reverse the employees’ decision to going on a statewide protest. Under the ESMA Act, employees in a long list of “essential services” like, railway, airport and port operations, post and telegraph are prohibited from going on strike. Under the same act, police get the right to arrest anyone, found violating the Act’s provision, without a warrant. Under the state’s new pension, the share of the government has been raised for 10 per cent to 14 per cent, which also means that even employees’ contribution will increase by 4 per cent. It is this that the state employees are protesting against. According to news agency IANS, more than 150 government employee unions are participating in the strike. Hari Kishore Tiwari, the convenor of the umbrella group of unions, told reporters that if their demands are not met then the strike will go till February 12. He also informed that they will not be including the health and power sectors in the initial days of protest on compassionate grounds, but they will include so at a later stage if their demands go unheard. “We gave the government enough time to think over our demands but things have come to this stage only due to their lethargy. The government cannot rob the employees of their democratic right to strike against wrong policies,” IANS quoted Shiv Baran Singh Yadav, Chairman of the striking employees union, as saying.